When I show up to give a lesson or teach a clinic, riders often ask me what my secret is too getting collection. Many times people call me and ask if I can come and help them get their horse collected better. After about 2 minutes on the phone – much of the time the person tells me they just want better collection and do not think they need to work on balance and self-carriage. There are times when I hear – well what bit do you use to get collection? I know that I often frustrate folks when I tell them that to achieve collection…it is long hours of proper development of horse and rider … in terms of muscle and timing (and a great many other things) … to develop collection. I go on to tell them that collection comes after we learn and achieve balance and progress into self-carriage. I also tell folks that no bit and no amount of pull by the riders hands is ever the answer to collection. Balance is the ability to move or to remain in a position without losing control or falling and it is a state in which different things occur in equal or proper amounts or have an equal or proper amount of importance. Self-Carriage is defined as a time when the horse is balanced (has independent balance as stated by Manolo Mendez) and self-maintains his own rhythm, tempo, stride length, straightness, outline and rein and leg contact and engagement. The horse still needs guidance from hands and legs and core and seat of the rider — but the horse is taking care of balance to them be able to work in a dynamic way. Just a quick side note — see how self-carriage relies on balance? Collection Collection occurs when a horse carries more weight on the hind legs than the front legs. The horse draws its body together so that it becomes like a giant spring whose stored energy can be reclaimed for fighting or running from a predator. The largest organic spring in the horse’s body, and therefore the easiest one to observe in action, is the back, including the spine and the associated musculature that draws it together in much the same way that a bow is drawn by an archer. (Collection can only come from a horse allowed and able to move freely – having learned to carry himself through training which lets him develop his own balance and rhythm. – March 24, 2014 by Caroline Larrouilh in an article written and published on the Manolo Mendez website). So let us get to the point. I have stated that no amount of pull of the hands, size or type of bit, or even one or two lessons will ever get you perfect collection. It takes development of balance, which in turn leads to self-carriage that finally allows you to work on the finesse of aids and timing that will help you and your horse achieve collection. Here are five exercises that I highly recommend you master on your journey to collection. There will be days in which you are excellent in your mastery of these activities…and other days will not be as great…but it is the dedication to the work and development of the horse that will ultimately lead you to success. Exercise #1: Learn the footfalls of your horse. Quite simply, from the ground or when you are in the saddle. Be able to call out what each foot is doing at any time in the rhythm of the movement of the horse. Exercise #2: Learn to direct the footfalls of the horse. Once you know where the footfall is, then you can begin to direct it to change time in flight and landing placement. This ability will help you with developing the rear engagement of your horse that you will need to achieve before we get to collection. As you do these two above exercises, in the first you are developing yourself as a rider. In the second, you are developing yourself and your horse to work in harmony and partnership. Exercise #3: Learn to do the first two exercises without the use of stirrups. You need to make certain that as a rider you can feel the horse and work with the horse and not have your balance compromised by using your stirrups as a crutch. You need to be able to balance with your whole body on the back of the horse. You also need to be able to post without your stirrups and achieve the goals of exercise 1 and 2 above (and yes for all the western riders – posting is encouraged at times). You cannot be heavy on your seat bones…you cannot be heavy on your legs…you cannot be heavy with your thighs. You must be balanced. (Just the other day Mark Russell said the rider needed to be like a champagne bubble riding on the back of the horse – yes that would be a nice picture of a balanced champagne bubble that did not have the rider leaning on seat or legs or feet or thighs…but rather, the rider would be in a perfect state of harmony and balance on the back of the horse). Exercise #4: Do the above three exercises with the lightest amount of contact…and occasionally, release any of your contact and determine if your horse maintains the rhythm and tempo. This exercise begins to tie in a measure of how much self-carriage you are achieving…and remember that self-carriage comes when you have balance. Exercise #5: Learn to do the first four exercises while working over ground poles and cavaletti’s. This simply adds a degree of difficulty that requires the rider to focus on balance, movement of the horse and changes in terrain (poles or cavaletti’s) that put the horse and rider into thinking mode. Most importantly in all of the above – you must remember to breathe through all that work. Once you have mastered those five activities … then you and your horse are ready to begin work on the exercises that will ultimately lead to collection. Please feel free to share this blog. Dr. Mike Guerini is a national clinician, author of multiple Horsemanship books, co-inventor of the Equine Hydro-T and specializes in DR 4 Balance – to help horse and rider acheive goals. Dr. Mike works with riders to enhance their performance based riding, Western Dressage and understanding and welfare and rehabilitation of the horse and you can learn more about Dr. Mike and his 6 C’s of Horsemanship at www.dunmovinranch.com. Dr. Mike is also part of Coach’s Corral (www.coachscorral.com), an online Horsemanship Coaching program for competitors. 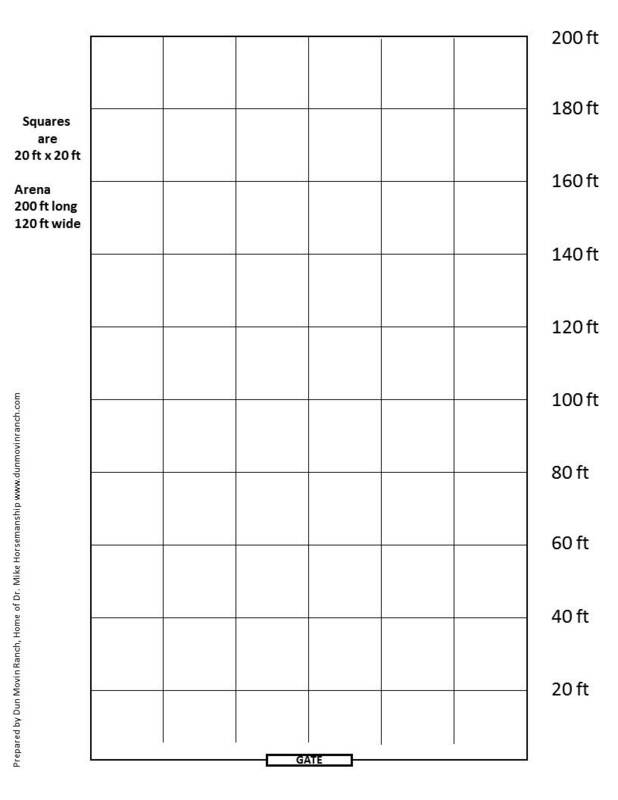 As we prepare to compete, one part of our planning is to look over the arena geography so that we can make a solid plan for where we need to be riding our horse. 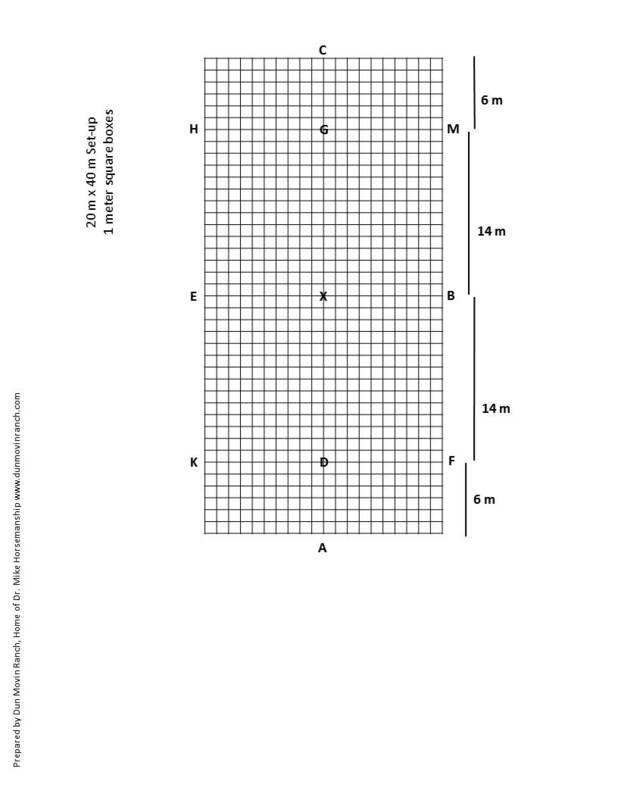 For Dressage tests, movements are performed at exact locations in the arena. For other events, we need to plan our movement or action based on where certain markers are located. These handy printouts (HERE) can help you plan your ride. I have designed PDF files that you can print out and draw on to plan and prepare your ride. So next time you are getting ready to show…take a few moments and plan your ride. Click on the link HERE for my website to retrieve PDF printouts of different Dressage and Show pen arenas that you can use to plan your rides and improve your scores. Thank you for Reading this blog. Share this Information! A few weeks back I wrote a blog on Western Dressage (WD) called “Western Dressage and the One Trick Pony.” In that blog I commented on the need for Western Dressage to reach beyond the normal WD test and educate/reward/encourage/empower/celebrate how people can use WD to build a better horse that is able to excel in many different areas. This blog begins the journey of sharing with you all how I think WD can help us build better horses that can compete in multiple events. There are many key elements in WD, many of them come from lessons learned from Classical Horsemanship, and used in Classical and Competitive Dressage. The first topic of discussion is the Circle. The circle comes in 20m, 15m, and 10m sizes. There are also half circles that can be included in this category for now. 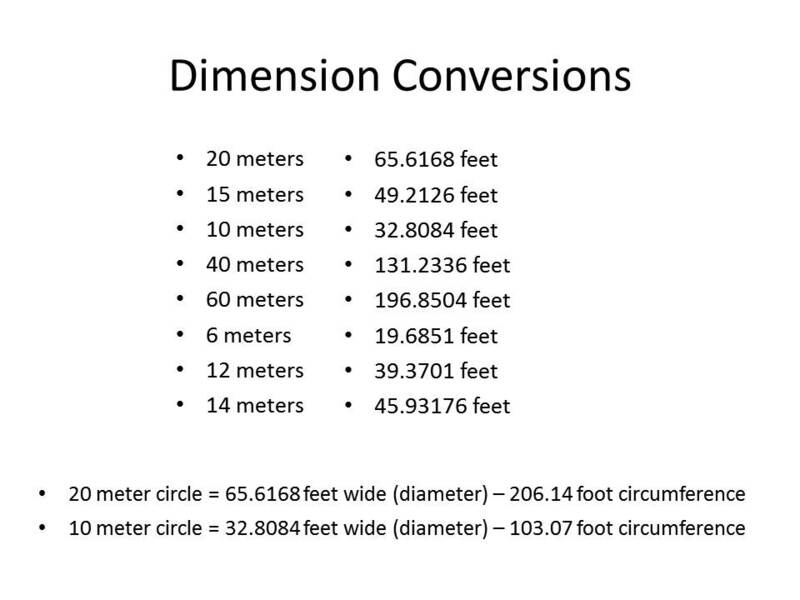 Okay, first lesson – the sizes in a measurement we use in our daily life. We need to realize that riding the perfectly shaped and sized circle helps the horse’s physical development (circles help develop lateral flexibility and engagement of the inside hind leg). On the mental side of things, riding accurate circles helps develop obedience. What does the Circle in WD teach us as a rider and horse team that we can use in other horse show classes? ARENA LOCATION/PRESENCE – This is all about knowing where you are in the horse show class. 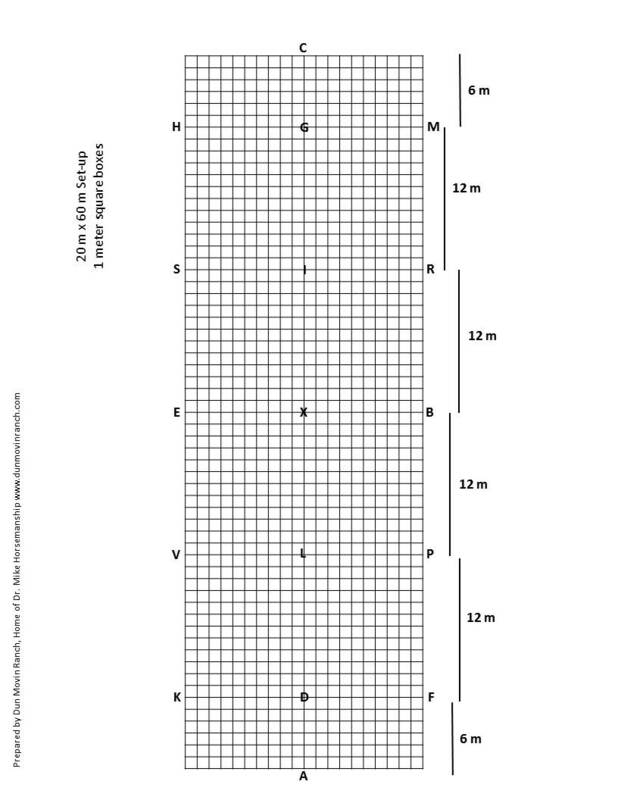 Are you near the rail, in the center, how far to the end of the arena – all this comes because you know where you are located with your horse at any time. When you ride the 20m circle, and do it with the correct size and geometry, you learn to view the surrounding area where you are riding with much more clarity. Centered Riding by Sally Swift has taught us to have soft eyes. With soft eyes, we are aware of our horse and the rest of the riding area with greater ease. When we focus on a point, and our eyes are not soft, we get fixated and lose the ability to plan our ride and prepare for the next maneuver. When we do not know where we are in the arena and how to navigate the area, we are forced to make big changes that disrupt our horse and our rhythm. Guess who always looks when we make those big changes – that is the exact moment in time the judge looks at us. In which Horse show classes is arena location/presence important? ALL OF THEM! I need to know where I am so that I prepare for the next trail obstacle, I need to know where the other riders are located, I need to know where center is for reining, I need to know where the end (or side) of the arena is when I want to turn a cow. We need to have nicely controlled circles for running barrels as well. For those who ride equitation – this is critical for you to know where you are in the arena — presentation matters. Good quality Circles help us to achieve success by planning, preparing, and making small changes as needed. BALANCE – This is about having your horse able to work out in space and not lean on the rail. When we ride a 20m circle (or 15m or 10m), there is at least some part of the circle that does not have a rail to hold up our horse. Horses and riders get to leaning on a rail and they rely on that for balance. An un-balanced horse and rider that depends on the arena fence/wall for success is one that is not as athletic as possible. With a well-balanced horse, the circle geometry is perfectly round. In which Horse show classes is balance important? ALL OF THEM! Again – each class benefits when we ride a balanced horse that can show his/her athleticism. 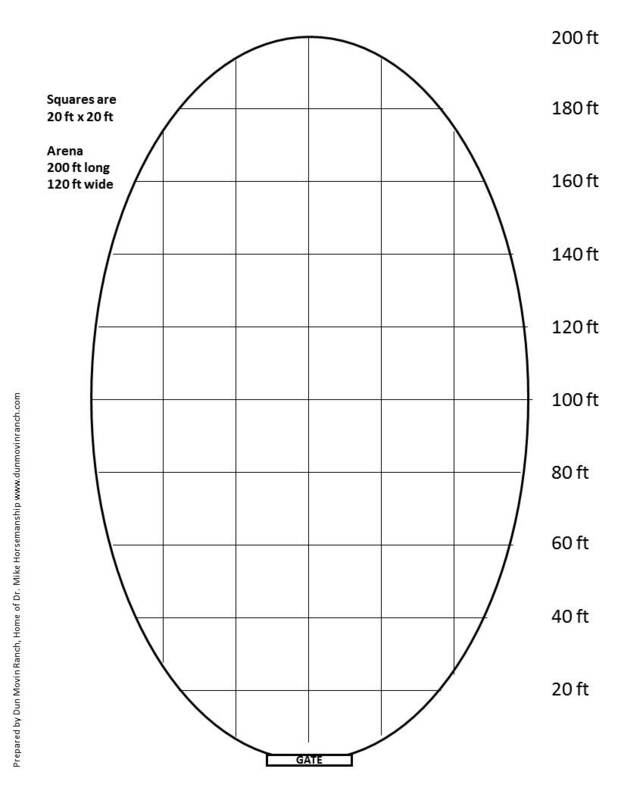 Ride the perfect 20m, 15m, or 10m circle without an arena fence and you will learn how to ride softly and with more feel. Reining (and reined cowhorse) especially benefit from balanced and well-rounded circles. Once again — Good quality Circles help us to achieve success by planning, preparing, and making small changes as needed. When we ride these perfectly shaped and sized circles, we have our horse mentally and physically balanced and ready for whatever comes next. A horse that is balanced is responsive to the aids – it is NOT leaning on one leg or one rein. FLEXIBILITY (Bending and Straightness) – One of the goals of riding a round 20m circle is to create flexibility. Flexibility refers to your ability to bend laterally through his side. The bend through your horse’s side should be equal from the poll to the tail. With a flexible horse you are developing one that is ambidextrous (that is he/she can bend just as easily on the right as on the left). Correctly ridden circles also teach the basic/beginning elements of engagement (bending of the joints of the hind legs) and circles also develop straightness. By definition, a straight horse is straight on lines and bent along the arc of a circle. In which Horse show classes is Flexibility (Bending and Straightness) important? ALL OF THEM! A flexible horse is an athletic horse. In my time I have had some horses come in for training that the rider described to me in these words “My horse is great. She goes really straight but we are having trouble getting around the corner.” I mentioned that likely half the time in any horse show class the horse was needing to be bent (turns, arena corners, etc). A few of these riders have looked at me and said they had never thought about that. For every horse show class we will ever compete in we will need a horse that is flexible and can answer our call for action. Riding a perfect 20m circle will help you develop a horse that is ready to answer your request and help the two of you look good in the show arena. RHYTHM – Rhythm of the gait of the horse is so important in WD circles. We want to establish a rhythm, timing, cadence to the gait and hold that the same throughout the circle. In which Horse show classes is rhythm (timing & cadence) important? ALL OF THEM! IF we are in western pleasure, ranch versatility, reining, or trail, we need to maintain an even rhythm of the gait. We want our horse traveling at a gait that has consistency because when the horse is consistent, the presentation looks better, but more importantly, the horse is ready/prepared for the pre-signal and aid you will apply to make those changes necessary to show smoothness. In Equitation classes, we want to have a nice rhythm because that is pleasing to the eye and accentuates your rider form and smoothness with the horse. So far I have mostly concentrated on the benefit to the horse. HOW ABOUT THE RIDER AND THE BENEFIT FROM RIDING THESE CIRCLES? Well the rider benefits greatly from learning those perfect circles. The rider improves his/her arena location knowledge as I said earlier. But the rider also improves the use of his/her seat and legs, and balance and softness of the hands when riding these circles. By riding these perfect circles, he/she learns how to make small changes and it is these small changes that tell the horse you are competent and trusting. Any time we make abrupt and physically reactive changes we tell the horse that we are not very trustworthy. Soft and small changes keep that trust and harmony in your ride. There are also a few life lessons in learning how to ride the perfect circle. I still work each ride to make that perfect circle. Some days I succeed and other days I break a few circles….but each time I get better and the life lesson is that with patience, planning, calmness, and time – I can be a better rider…better person…better equestrian and along the way I get the benefit of learning these lessons with a horse! Hopefully this has expanded your awareness of why and how these circles in WD can help you build your all around horse and develop a better foundation of training. You do not need to ever take a WD test, although there is a great benefit and feedback that comes from taking one of these tests (you get a score and written remarks), but if you ride in a western saddle and you do not take the time to see how well you can ride that perfect circle – you are missing out on a learning opportunity for you and your horse and you might be keeping yourself out of the winners place in your western show events. The circles we learn and ride in Western Dressage (tests, clinics, lessons, etc.) – or in the Cowboy Dressage world – help us to build a better western horse. Thank you for Reading this blog. Share this Blog and Share your Thoughts! The other day I was speaking with a friend who had never spent much time around a horse barn. He asked me share the day-to-day routine around the barn. I was in one of my odd humor moods (as a scientist we have weird humor days) and told him…well it is not for the faint of heart – there are quite a few times we use four letter words around the barn. We even use these four letter words at the branding pen, in the arena, when we take horses from one place to another, when the farrier visits, and even when the vet comes around. Well at this point, I could not keep from laughing. He looked at me in horror and I decided it was time to tell him about our four letter words in the Horse world. At this time he shook his head and said to me – I think that helmet on your head must be squeezing to hard cause if you think this way your brain is damaged. I hope this gave you a quick laugh and helped you all realize how much fun we have around the BARN. I sure wish I could STOP…no wait I want to HALT. WHOA — time to get off this crazy fun writing and get back to the FARM. Thank you for taking the time to read this blog and I hope it made you laugh.